Rollin into another Mancuso Quilt Festival! The World Quilt Show @ the Radisson Center of New Hampshire. Manchester, New Hampshire. August 14-17,2014- One of my favorites places to visit! 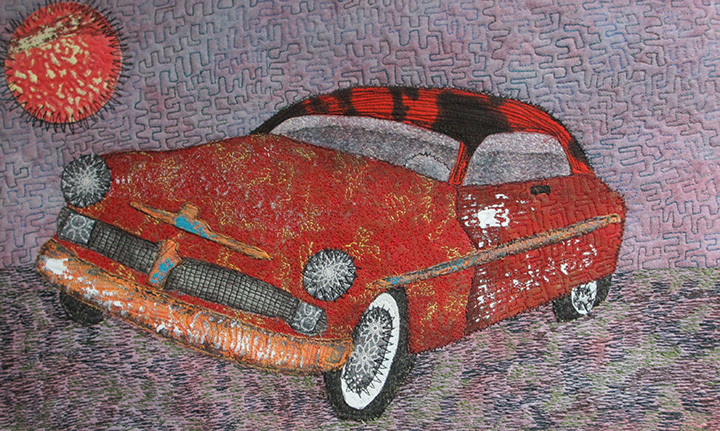 Thrilled to have my “Cool Classic Rides” A 27 piece fiber art collection continue to roll into wonderful Mancuso venues. Many thanks to Mancuso. Deborah Stanley who curated this exhibit and to Valdani Threads. Their fabulous threads gives the bling to each and every funky ride. If you are there Saturday, August 16th (11-3) stop by for a chat. I am honored to be able to attend another fantastic Mancuso event! Hope to see you there! Meet and greet in front of the Mercury! More “Car” dates coming soon! It’s wonderful to know that your “Cool Classic Rides” are being seen by multitudes across the nation. I feel honored to have had the chance to experience is series of outstanding works first hand.